I created a couple of straightforward libraries to be used in almost every project. So evidently these libraries are a good candidate for NuGet. This will decouple the libraries from the projects that they are used in. It also forces the Single Responsibility principle because every NuGet package can be used on its own, with only dependencies on (very few) other NuGet packages. Creating the packages for one version of .NET is quite straightforward, and well-documented. But the next request was: “can you upgrade all our projects from .NET 4.5.2 to .NET 4.6.1, and later to .NET 4.7?”. What about the NuGet packages? Download the latest version of nuget.exe from nuget.org/downloads, saving it to a location of your choice. Then add that location to your PATH environment variable if it isn’t already. Note: nuget.exe is the CLI tool itself, not an installer, so be sure to save the downloaded file from your browser instead of running it. I copied this file to C:\Program Files (x86)\Microsoft Visual Studio 14.0\Common7Tools, which is already in my PATH variable (Developer command prompt for VS2015). So now I have access to the CLI from everywhere, provided that I use the Dev command prompt of course. So now we can use the NuGet CLI, described here. NuGet Package Explorer is a ClickOnce & Chocolatey application that makes it easy to create and explore NuGet packages. After installing it, you can double click on a .nupkg file to view the package content, or you can load packages directly from nuget feeds like nuget.org, or your own Nuget server. This tool will prove invaluable when you are trying some more exotic stuff with NuGet. 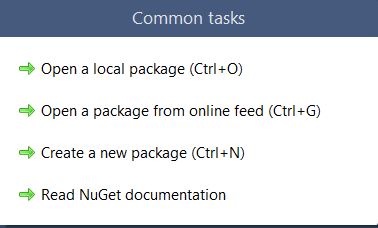 It is also possible to change a NuGet package using the package explorer. You can change the package metadata, and also add content (such as binaries, readme files, …). An assembly (or a set of assemblies) is a good candidate to be a package when the package has the least dependencies possible. For example a logging package would only do logging, and nothing more. Like that NuGet packages can be used everywhere, without special conditions. When dependencies are necessary, then they are preferably on other NuGet packages. In Visual Studio, create a project of your choice. Make sure that it compiles well. in your project folder, and a Nuget package will be generated for you. 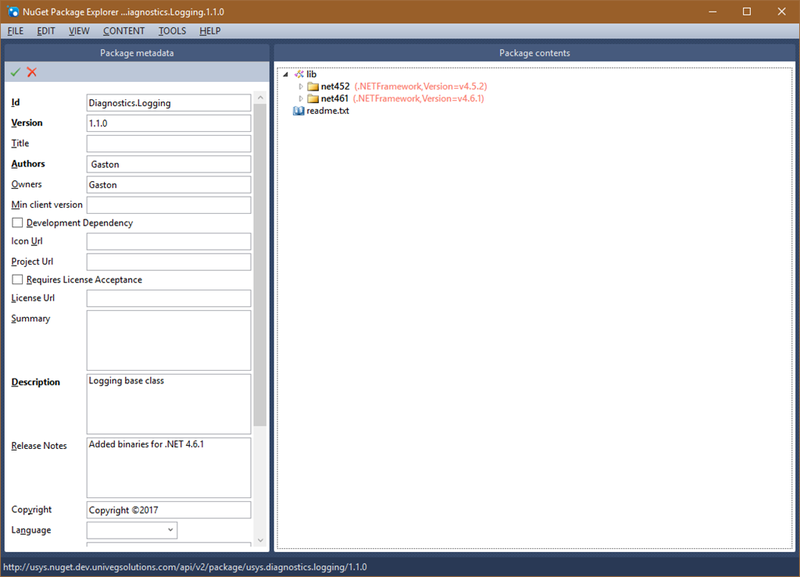 If you want to know if the contents of your package are correct, use Nuget Package Explorer to open your package. Here you see a package that I created. It contains some meta data on the left side, and the package in 2 versions on the right side. You can use this tool to add more folders and to change the meta data. This is good and nice, but not very automated. For example, how can we create a Nuget package like this one, that contains 2 .NET versions of the libraries? I wanted to separate the creation of the package from the rest of the build process. So I created a NuGet folder in my project folder. I also wanted this package to be easily configurable, so I used some variables. set nuget="C:\Program Files (x86)\Microsoft Visual Studio 14.0\Common7\Tools\nuget.exe"
The 2 first variables are the real parameters. All the other variables are built from these 2 variables. The %msbuild% and %nuget% variables allow running the commands easily without changing the path. Thanks to these 2 lines this script will run in any “DOS prompt”, not just in the Visual Studio Command Prompt. In my batch file I don’t want to rely on the existence of a specific folder structure, so I create it anyway. I know that I can first test if a folder exists before trying to create it, but the end result will be the same. Notice that I created Lib\Lib. The first level contains the necessary “housekeeping” files to create the package, the second level will contain the actual content that goes into the package file. The 2 copy statements copy the “housekeeping” files. Each element under the <PropertyGroup> element is a property that can be set, typically in Visual Studio (Project settings). 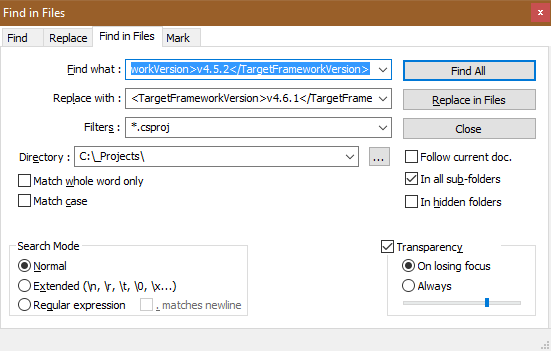 So compiling for another .NET version is as simple as changing the <TargetFrameworkVersion> element and executing the build. In this line MSBuild is executed, and the properties OutputPath, BuildOutputLocation, Release, Platform and TargetFrameworkVersion are set using the /p switch. This makes building for different .NET versions easy. You can find more information about the MSBuild switches here. So now we are able to script the compilation of our project in different locations for different .NET versions. Once this is done we just need to package and we’re done! We automated the creation of NuGet packages with an extensible script. In the script as much as possible is parameterized so it can be used for other packages as well. It is possible to add this to your build scripts, but be careful to not always build and deploy your NuGet packages when nothing has changed to them. This is a reason that I like to keep the script handy and run it when the packages are modified (and only then). This entry was posted in .Net, Architecture, Codeproject, Development and tagged Nuget. Bookmark the permalink.